As one of the exponentially growing industries, e-learning faces many challenges in content development and documentation management. 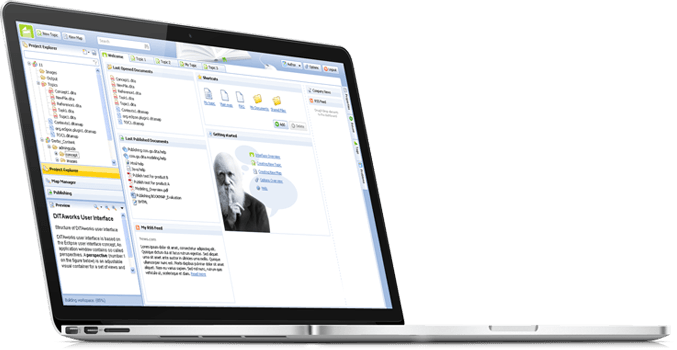 DITAworks provides state-of-the-art features for developing, maintaining and translating educational documentation, as well as generating e-courses, lessons, learning materials, trainer materials and SCORM content. All of this is managed by DITAworks from a single-source database. DITAworks can be used to manage the content of multiple user groups or individual users. The main objective of a learning content management system is to prevent unwanted duplication of information and manage all learning objects. Improve Quality, Efficiency and Accuracy. Less pressure on writers and more control over the creation process guarantee a higher level of quality. In learning, this content management system will contain consistency between similar courses and avoid duplication of the same materials. With DITAworks you can tag parts of a topic by product, audience, or other characteristics. You can then include and exclude parts of a given course, essentially creating whole new variations with only existing content. Save on everything from paper to translation – no longer will you need to waste resources doing things by hand (yours or somebody else’s). Never translate a document twice, only pay for parts that are unique! When learning, the DITAworks content management system allows to save everything only once in an XML/DITA format, dramatically reducing the work required to keep it up-to-date while simultaneously raising the quality of documentation as a whole. The methodology and a formalized lifecycle of content management significantly optimizes the creation of new educational modules. DITAworks allows to reuse content over and over again seamlessly, essentially eliminating any need to write the same thing more than once. The way it is done is through topics that can be added and deleted to any required end document. As educational content is often saved in different formats and translated into different languages, such an approach reduces both costs and time required. Using DITAworks as a learning content management system you can personalize the created learning courses. The learner can easily choose between different modules from a single course, receive the required material, and only pay for that. Integration with the e-learning systems allows to conduct courses remotely. Moreover, precise control over the editing, reviewing, translation, and publication processes is guaranteed.